First up was a hilly TT. Sadly the course had to be shortened due to roadworks, which cut out some of the hillier bits (where I tend to make up time on the those with full TT bikes), but I did OK, ending up 6th. I felt pretty strong right the way through, though I nearly froze to death wearing just the skimpy skinsuit, riding past people scraping the ice off the windscreens of their cars. Brr! Next up was one of my favourite events, Battle on the Beach. 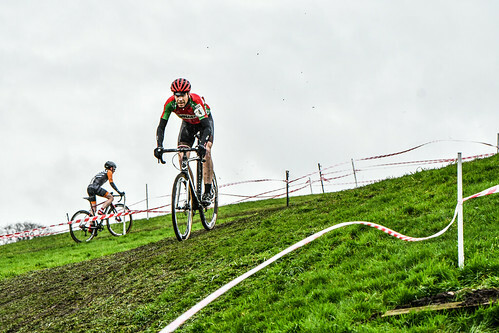 I’d headed down to South Wales a few days early (in order to get officially old…) and had spent the week before the races eating too much, but I was still very much ‘up for it’ while standing in with the Seeded Riders. My legs felt fresh, the sun was shining, the bike set up was (to my mind) spot on and prior knowledge of what was about to happen saw me full of hope of a great result. Annoyingly, my hopes lasted less time than the starting hooter. The bloke next to me tried to set off on his bike, rather than running (hard to do due to the super soft sand), he got anout 2 pedal strokes in, ran out of power and flopped over to his left, still clipped in, landing flat on top of my bike as I tried to run past, pinning it on the ground underneath him as he flailed about. I glanced up at the front end of the race hurtling away down the beach as I tried to wrestle the bike from under him. Race over. Balls. Eventually I managed to prise my bike out from under him and spent the rest of the race working my way up through hundreds of riders. I obviously had good form as I was able to fight my way back up into the top 50 before running out of laps, while still making up places. Shame, but a great workout and still a fantastic course to race on. I’ll be back for number 7 next year! Finally, another trip up to ride the Dirty Reiver. 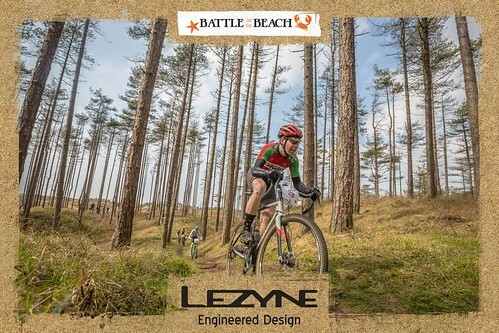 To me it’s almost the opposite of Battle on the Beach, with wide, solid tracks stretching for miles, instead of swoopy narrow singletrack with soft sand to keep you on your toes. It’s usually bloody cold as well, where Battle on the Beach somehow manages to steal a bit of summer, despite being earlier in the year. One thing that both events manage to have in bucket loads is a great, fun atmosphere. Thousands of like minded riders buzzing about the trials to come. Brilliant stuff! Once again, it was bloody freezing on the startline, though thankfully(!) I got to spend the final few minutes before the race stealing a bottle cage off the bike of one of the organisers (thankyouthankyouthankyouTHANKYOU! ), after mine shattered in the cold. Not the kind of warm up you’d imagine would be good for your body, but at least it kept me occupied! I got everything sorted just as the riders started to stream through the startline. Phew! I worked my way up through the enormous peloton to the ‘pointy end’ in time to cross the official “timed” beginning of the course with the fast lads. This pic from Stephen Smith’s album on Facebook – some great pictures of the event! Perhaps one of the hardest things I’v ever done is get out of the van, into a cold, miserable deluge that wholly encompassed this year’s Hit the North race over in Manchester. I mean, the inside of the van was all warm and dry. there was a sleeping bag and pillow tucked away in the cupboard right by the pull out bed and it was still damn early in the morning (I’d got up especially, to ensure I got a parking spot). A few hours kip, followed by a nice brew (all the ingredients were also tucked away), it could have been lovely. I didn’t though. I pulled on my wellies, started saying hello to familiar faces before even getting across the car park, trudged my way down to where sign on was located, swore as an overflowing river where a path used to me overflowed into my wellies, leaving me with two buckets of cold water attached to my feet ad set about getting warmed up for the race. 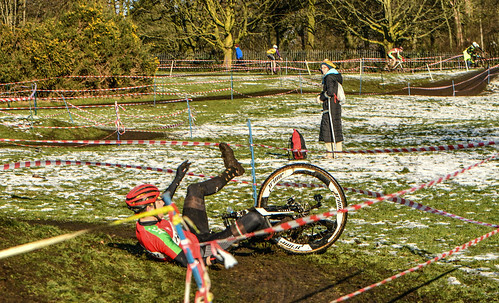 Well, I would have got warmed up if it hadn’t taken me hours to get back to the van – it seemed that the whole of the NW cyclocross league was there, plus all the MTB riders I know, plus more familiar faces from further away. Brilliant, and weirdly heartwarming to recognise and be able to great that many ace people. The only downside being that I had just enough time back at the van to tie my number board onto the bike with twine, change out of my welly/pond footwear into something more carbon fibre-y and use a quick ride back to the start as my warm up. It was all downhill from the van to the start line, so I got there bloody freezing and already drenched. Ho hum! For some (stupid) reason I ignored the fact that I was on the singlespeed mtb, with it’s twiddly small gear, and elbowed/shoulderbarged my way to the very front row. Th starting hooter went off and I was immediately swamped by people with sensible bicycles hurtling past me while I twiddled away with my legs flapping at about 200rpm. That, pretty much, set the scene for the whole race. Any flat/fast parts of the course people whizzed past, anything uphill/slower/harder gave me a chance to get back in touch and race. Fair enough, I thought to myself, this is meant to be fun anyway. The two hours passed surprisingly quickly, and so much fun was had I barely noticed the continual pouring rain (though much more of the course resembled a stream towards the end…and the bits that were streams to start with started to resemble mighty rivers). I crossed the finish line with no idea how I was doing in the overall scheme of things – I knew most of the super fast lads had well and truly buggered off, but it didn’t seem to matter. I’d pushed hard wherever the gear on the bike let me, got some great ‘skills’ training in and had a proper laugh. you can’t ask for more than that! I’ll openly admit that I’d started the off season early and had spent the week eating terrible (delicious, usually biscuit based) food while barely riding a bike. Never mind, the sun was shining on the snow (slightly melting it…), the youth and vets races seemed to be going well and everyone seemed to have the “last day of school” feeling going on, me included. I couldn’t be faffed doing a proper warm up, I just wanted to get stuck in a bit and have some fun for one final time before stripping the bikes down for their summer hibernation. Off the start I didn’t do too badly. Rob got another lightning start but I got up into 2nd place and began working my way back up to him before my race was rudely interrupted by some hidden ice under one of the fast corners. I went down like a sack of spuds and watched several people get past me as i flailed about under the course tape. Back up as quickly as possible and back into the race, now down in 5th, I tried to close the gaps but a combination of the season-old drivechains of the bikes starting to give up (if you want to test your concentration levels, try racing cx on a tight, twisty course, covered in ice and off camber while simultaneously ‘feeling’ your drivehchain and backing off/back pedalling each time the chain tries to jam itself up into the frame with chansuck. Skills required 🙂 ), stupidly crashing out on the same patch of ice a 2nd time and then getting all wound up with myself for messing up…which (of course) lead to more mistakes (and a couple of slightly embarrassing crashes that really shouldn’t have happened… meant I only made it back up as far as 4th. On the plus side, during my final lap or two I was able to mentally get a grip, despite the setbacks and refocus on racing – I didn’t quite have the power to get back on terms with Rob, Matt and Martin but I was able to close the gap right down where I may have previously remained disheartened. Several lessons were learned – about the bikes and their set up and about how to manage my head during the race. Good stuff. And that, as the saying goes, was that. Season over. On crossing the finish line I allowed myself a bit of an indulgent look around at the group of riders who had finished in front of me – hearty, heartfelt handshakes were being passed around between them as I rolled over. I know I spend quite a bit of time on these blogs thanking the people who support me in the pits, but equally I should thank everyone I’ve got to race against. I shook hands and offered thanks and congratulations and genuinely meant every word, every race has been close, hard, exciting, full on and yet always fair and good natured. I have nothing but utter respect for everyone who I’ve raced with this season, it’s been bloody brilliant. Next season, it’s all change. Plans are very much afoot. 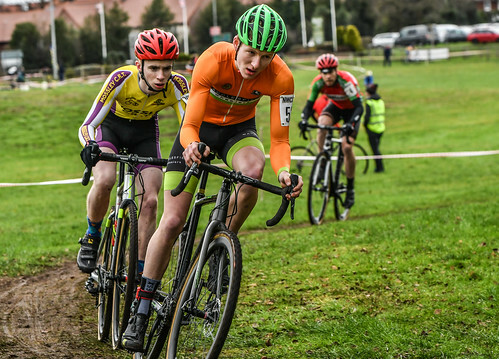 I’m moving up a category, to V40 and fully intend to get myself to as many National Trophy races as possible. The NW league is just too good right now to avoid so I’ll be there as much as possible – racing the (fast!) v40s and, whenever practical, sticking my nose in with the seniors to keep myself nice and keen. The most expensive crank arms I've ever bought ? 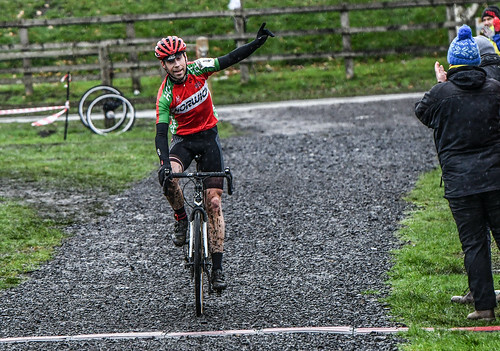 …apart from the last two weekends, where there’s been no CX races, obviously. 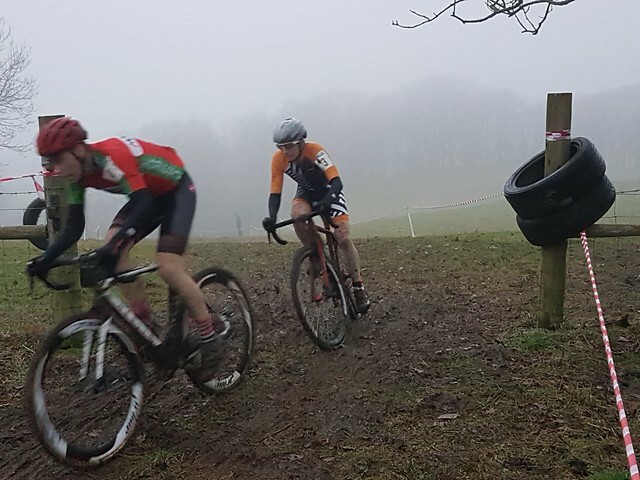 After a brief hiatus, during which I grew to love the whole “not having to pack everything / spend hours cleaning and fixing everything” routine that a gap in the league calendar provided, the NW races leapt back into action last weekend with a return to Blakemere Village. I’d enjoyed the previous round held there and had high hopes of another fun course. 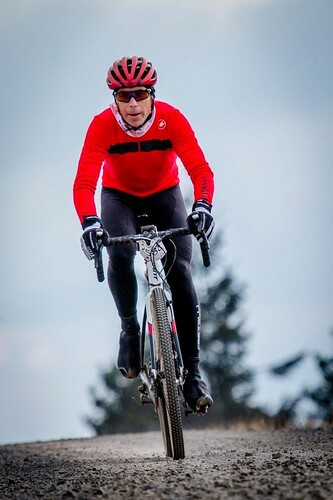 I may have been getting a bit fed up with all the faffing before and after racing, but once on the bike, I was still as enthusiastic as ever to go flat out. Last time round the course could be summed up with the phrase “never more than 3ft from the next corner”, this time round it was dominated (to my mind) by a huge straight section taking you from the far side of the course back to the pits at warp speed. A rare opportunity to slam the chain onto the big ring and hammer along. Cool. 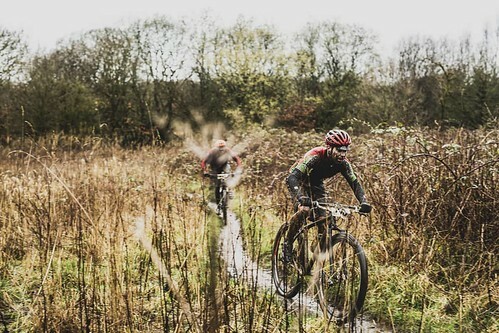 Don’t get many of those, especially at this time of year when you’d expect ground conditions to be somewhere between “mud” and “doom” – somehow this time round the course seemed even drier and grippier than last time. As expected, the speed off the start line was fast. Within a few seconds Rob and Tyler had managed to open a gap on the rest of the field – me included – but I got my head down and paced myself back up to them, trying to use the strong tailwind giving us an extra boost along the stright to my advantage, while keeping steady when we turned to ride back into it as a headwind. No surges in speed, just a constant effort to close the gap gradually. 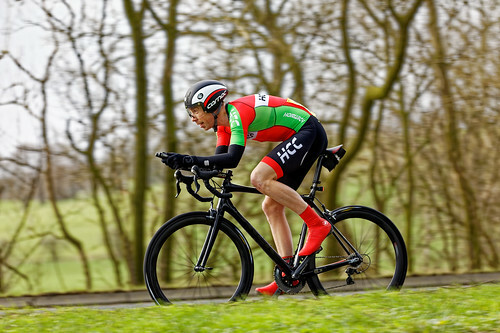 As we hit the – as I called it – hill reps section, I decided that my legs seemed to be happy enough with the race so far and I’d have a dig to see what happened. Well, as the hill reps section involved 3 stomps up the same slope, each with a tight bend at the top and drop back down between each, I decided to have 3 digs in a row. I knew Martin would be able to close down one attack with the greatest of ease, but what about 3? If he managed to stay with me there were enough laps left for me to recover from the attacking and if I got a gap I had a slightly tailwind assisted straight immediately after to push on and build on it, so off I went. To my delight, a gap opened up, so I set about burning a few matches before turning to face the wind – get as much space between us as I could before it became harder for him to get back with me. Approving noises coming from the pits as I rode past them spurred me on and I set about pacing myself round the course like I had for the first lap or two, balancing my effort as much as possible in case Martin got back to me. For a few more laps I kept everything as similar as possible – same line through each corner, same gear shifts at the same time, metering out and surges on the climbs and riding steady through the corners. It had started raining quite heavily but he course was holding up well, so the levels of grip on offer remained good, with everything staying rideable. The bike didn’t seem to be clogging up with mud so I decided I wouldn’t swap to the spare unless I had a mechanical issue. More approving noises from the pits told me I was opening up the gap steadily with each lap. Just stay steady, don’t start mucking about trying to rail round the corners or sprint up with e hill reps like a mad man, was the order of the day. The last lap bell started ringing a bit earlier than I expected. I took a few glances around to make sure there were no counter attacks coming, saw that my lead was – barring disaster – good enough to get me round safely and started to worry about what to do when crossing the finish line. Maybe you’ve never thought about this before. Maybe you’re so used to winning races you barely even notice it. I don’t win that many bike races (and you can stop shouting “that’s an understatement!” right now, thank you very much…), so what was I going to do to look awesome rolling over the finish in 1st place? It’s a contentious issue – cyclingnews.com has a good article dedicated to the best and worst finish line salutes – and I ended up getting so stressed about it I eventually settled for a simple “one hand in the air”, rather than anything particularly memorable. Maybe I should add some “finish line celebration” practice into my training (oh stop laughing). Thanks to Ellen for all the pics! And that was that. With just one race left as a member of the senior category (officially), I’d got my first win. Bit last minute, but hay ho, better late than never. On to the final round next Saturday, then it’ll be time to think about SUMMER! Woo! I thought I’d got away with it a bit at Macclesfield last week. Despite being in the middle of the Xmas / New Year period and all it’s calorific trappings, I didn’t feel too sluggish. same notch on the belt buckle and a decent spring in my step. All the extras caught up with me today though. The Waddow Hall course was delightfully not flat. 1600ft of climbing in just over 8 miles allows for nothing but either going up or thundering back down again. Ace. And, usually, my forte. I like a good climb, me. Lungs popping, jaw slung low as you fight gravity and traction while bouncing off your own internal rev limiter. Torque over horsepower. you get the picture. Problem was today I would be tackling the course and racing everyone with quite a few mince pies tucked safely away round my midriff. 2nd helpings and days spent eating rather than training are not conducive to skipping up hills. Never mind. I decided to class today’s race as an abrupt end to the gluttony and set about pushing myself on a route that appeared to be an awful lot of fun. I got a half decent start, right up to the point where half a bird’s nest leapt up into my rear mech. Although it didn’t jam the gears up I knew I’d have to dive into the pits on the first, frenetic lap rather than concentrate on staying up with Isaac as he opened up a bit of a lead on everyone else. Drat and bother. Down to fifth and some gaps to close then. Where I’d normally make up a decent chunk of time, on the long dragging grass climb that broke a lot of hearts (and lungs) during the day, I had to suffer like a dog to make up any time at all. Not that anyone found it easy, of course! So I put as much effort onto letting the bike fly on the descents to close the gaps in front. It may have looked a bit “all over the place” but I had great fun doing my best “foot out / flat out” impression. I managed to work my way back up into 3rd, behind Martin, with 4 laps to go and what followed was some of the closest racing I’ve done in a long time. Over the new few laps we swapped places countless times – neither ever far back from the other and neither at all aware we were closing the gap to Matt in the lead, so engrossed were we in our own private battle. The final result came down to one moment, on the one flat section of the course – an innocuous looking, slow speed hairpin bend just past the pits. Whoever was in front out of this corner held all the cards really; the following descent was too narrow to risk an overtake, and after one last corner the final drop down to the line was simply too fast to get alongside and past. Despite being a good minute or two from the line, those in the pits would be able to see the end of the race, barring disaster. Into the hairpin I was just in front. I picked a tight line, working on the assumption that a slip would push me wide ‘closing the door’ on any attempt by Martin to ride round the outside of me. My front tyre washed out, as I thought it might, but somehow my foot popped out of the pedal as I fought the bike back into shape. A moment of not being able to put the power down was all Martin needed to lunge past as I flailed, clipping back in as quickly as possible and jumping on to his back wheel as quickly as I could. Daaaaaamn!